From the carpet of phlox and trillium that drape the slopes of Grandfather Mountain to the shores of Lake Tillery shrouded in fog, miles upon miles of trails are coming to life under the Tarheel-blue skies of North Carolina. There’s everything from peaceful forest strolls to heart-pounding Blue Ridge ascents across the mountains-to-sea landscape. 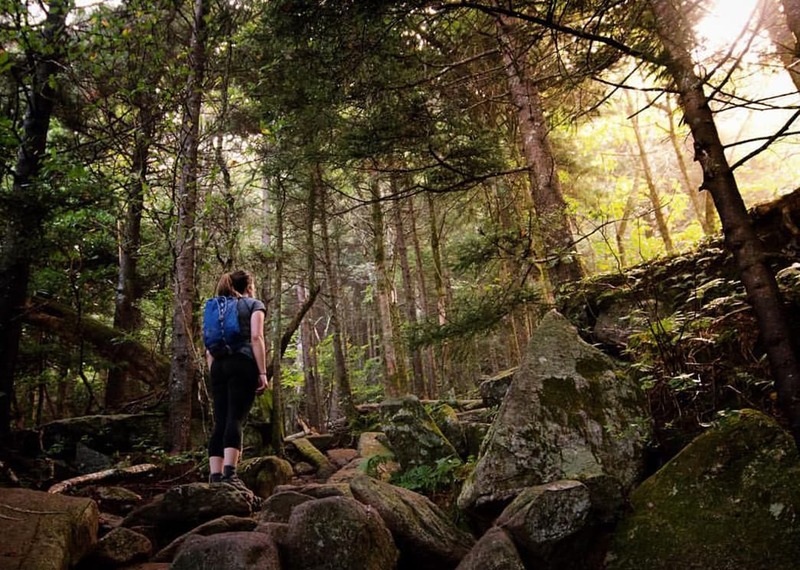 So, lace up your boots and grab your poles, because spring is prime time to hike the Charlotte region. Hike the Mountain Bridge Wilderness Area of South Carolina to visit Jones Gap and Caesars Head state parks on the 5.3-mile Jones Gap Trail. The trek follows the Middle Saluda River for endless opportunities to sunbathe on the rocks and splash in the gentle current. For a little extra distance, take the 1.6-mile Rainbow Falls spur trail and enjoy the azalea, meadow rue, and Solomon’s plume bursting with springtime color at the base of the falls. If you’re looking for a cardio challenge, the 4-mile round-trip Summit Trail to Elk Knob is the hike for you. It’s a non-technical climb to one of the highest peaks in the Carolinas, with 360-degree views of Three Top Mountain, Mt. Jefferson, Grandfather, and Mt. Mitchell. Soak in the vistas at 5,520 feet and picture a time when vast herds of elk spread across the valleys below. Don’t let the relatively short, 2.7-mile distance fool you. 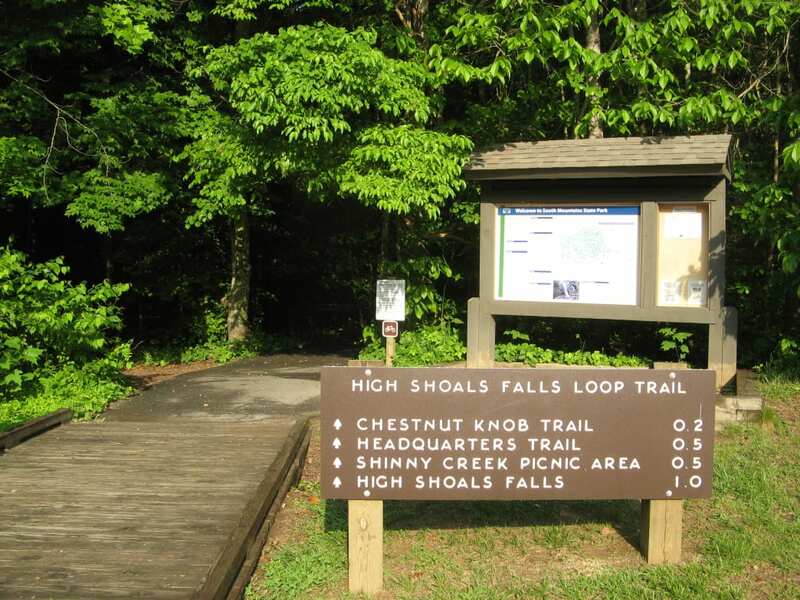 South Mountain State Park’s High Shoals Falls Loop is one of the toughest trails in the region. A short walk along the Jacob’s Fork River leads to an abrupt ascent alongside High Shoals Falls, which tumbles 80 feet over a series of rock ledges. A stone staircase and series of wooden bridges take you to the top of the falls, where you’ll continue to climb the rugged knobs of the South Mountain range. From there, you can make a quick descent back to the trailhead, or extend your distance on the park’s 40+ miles of backcountry trails. You’ll travel across some of the highest peaks in the Southeast on this ridgeline trek starting at the peak of 6,684-foot Mt. Mitchell on the Deep Gap Trail. At the summit parking lot, the 4.3-mile out-and-back hike takes you through spruce-fir forest across Mt. Craig and Big Tom, and rock scrambles lead to stunning views across the Black Mountain range. Be sure to layer up because storms blow in quickly and temps are always 10 to 15 degrees cooler on the ridge. The heavily forested, lower elevation habitat of Stone Mountain State Park makes it the perfect early season hiking destination. Hit the trail just as the trees are leafing out and the northern flickers and red-bellied woodpeckers are becoming active. 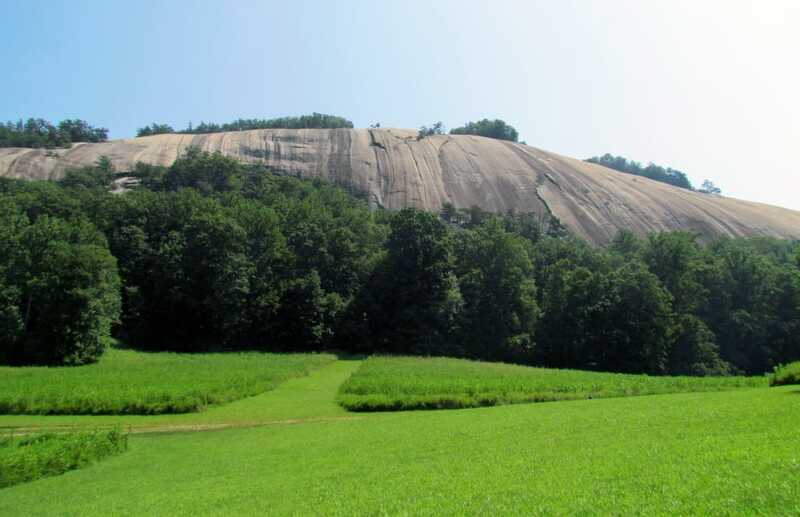 The 4.5-mile Stone Mountain Loop across the summit of Stone Mountain takes you past a historic homestead and 200-foot Stone Mountain Falls, with views of the 600-foot granite rock face that’s actually just the tip of the 25-square-mile slab that lies underground. The ancient Uwharrie Mountains rise only 1,000 feet above the North Carolina Piedmont, worn down from centuries of wind and water. A moderate, family-friendly 5-mile hike through hardwood forest to the summit of Morrow Mountain starts on the Laurel Trail, where you’ll hear peepers and chorus frogs chirping their welcome. Pick up the Sugarloaf Mountain Trail to the park’s second highest peak, then continue on the Morrow Mountain Trail to the highest point in the park and views of Lake Tillery below. On the loop trail around the summit, you can find rock debris, called rhyolite, that American Indians used 10,000 years ago to make spearheads, knives, and axes. The beauty of Chimney Rock has earned it a colorful spot in North Carolina tourism history. Once privately owned by the Morse family, the expansive overlook at Lake Lure was made more accessible to tourists in 1949 by blasting an elevator shaft through the crag’s core. People were ferried to and from the overlook, gift shop, and snack bar by elevator. Luckily, over time the focus shifted to preservation of the Hickory Nut Gorge’s 500-plus plants, resident and migratory birds, and peregrine falcon nesting sites. 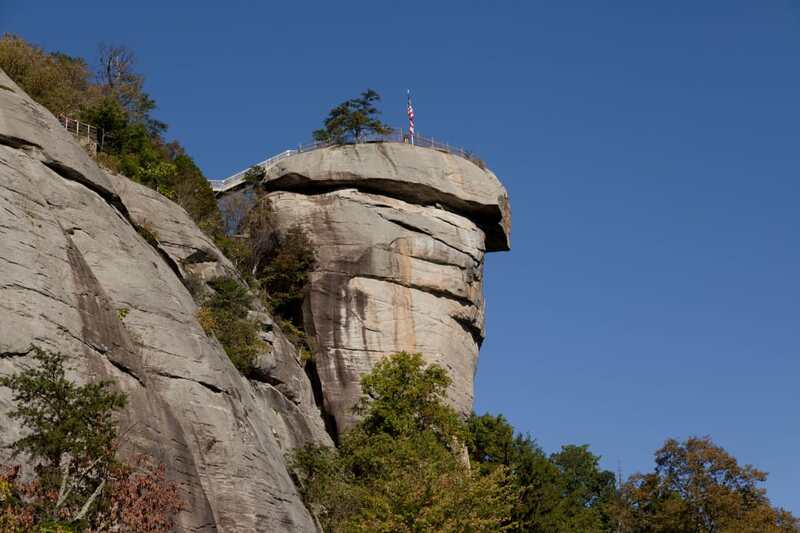 In 2007, Chimney Rock became a state park, ensuring that this ecosystem would be protected. The half-mile climb to Exclamation Point reveals a dramatic view of the Blue Ridge Escarpment and Lake Lure below. Side trails Opera Box and Devil’s Head offer more views and a chance to see raptors riding the thermals overhead. From there, you can hike the Skyline Trail just over a mile along the ridge to 404-foot Hickory Nut Falls. 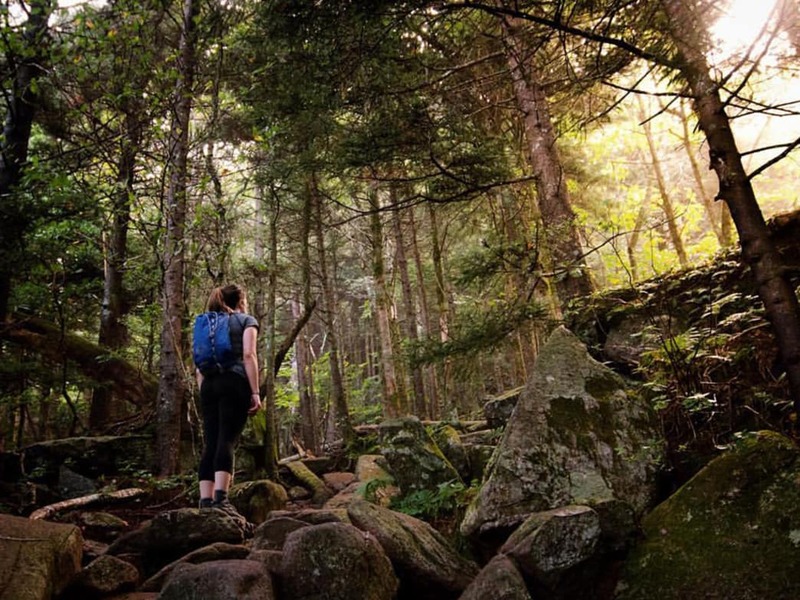 A gentle climb through the meadows of Grandfather Mountain’s western flanks on the 3.1-mile Profile Trail is North Carolina wildflower hiking at its best. Early season violets give way to jack in the pulpit and bluets in April, mountain laurel and flame azalea in May, and turkey beard, coneflower, and ironweed through the summer. Budding hardwoods transition to stands of Canadian fir near the ridgeline, where loose rock slows the hiking pace. If you’re looking for more adventure, pick up the Grandfather Trail at the ridge for a short hike to 5,946-foot Calloway Peak or a more technical scramble using ladders and cables to reach Grandfather’s iconic Swinging Bridge.